Edit: The postcard is from Dan’s commander at Camp Liberty. Straight from Iraq to Heather, courtesy of Dan. If you want to send Dan cool stuff, let me know and I’ll send you his address. 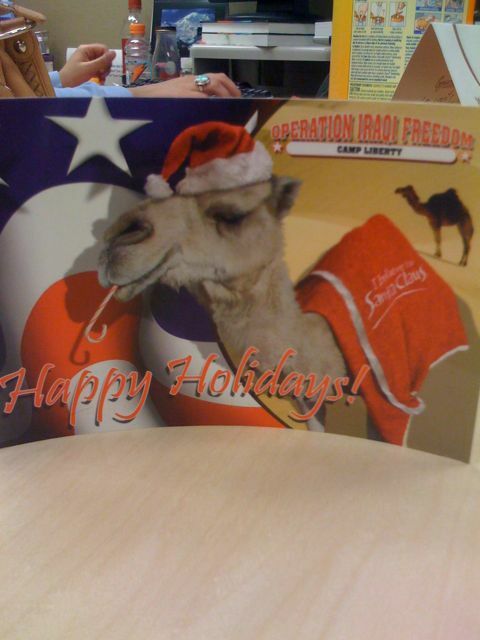 Clarification: The postcard is from Dan’s commander at Camp Liberty. Hi, Rachel! I really got a kick out of this post! Heather sent it to me in an email. I’ll have to tell my commander that his postcard inspired a blog posting. I also wanted to say thanks for the wonderful box of gifts you mailed over here. I just got the box a few days ago because I’ve been gone for about a month. However I distributed all of it to my platoon the next day. We love it all. Thanks so much for it! I hope you and Roger have a great Holiday season! I’m glad you liked the post and box of gifts. Have a great holiday!